FELICITACIONES AL CAMPEÓN Y DEMÁS PILOTOS!! This is a moment when we are proud to be czech. Congtualions mrs. Sonka. It was amazing. Yo are the best. Thank you for an incredible season of 2018 and looking forward to the 2019 season! What the races they were today! Congratulations for the winners! I hope everyone enjoyed the event cheering their favourite pilots. It was a really fantastic season! 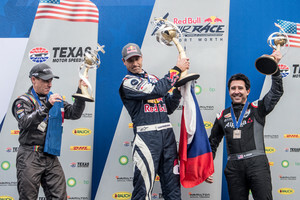 Thank you Red Bull Air Race Team for the possibility of watching online of all those eight fantastic races! I already can't wait for the 2019 season. Best regards from Poland! And that's a wrap, not just for Race Day here in Fort Worth, but for the 2018 season. What an epic eight races of full throttle, high-G racing. Thanks for joining us and being part of the Red Bull Air Race story. And not forgetting... congratulations to 2018 World Champion Martin Sonka! We'll be returning in 2019 for another season of spectacular racing action. Stay tuned, and see you again soon.